Dubai Festivals and Retail Establishment (DFRE) has announced details of the next Dubai Shopping Festival (DSF), featuring exciting events, promotions and opportunities to enjoy shopping coupled with world-class entertainment. Running from December 26 to February 2, the 24th edition of the festival will feature over 700 brands participating at 3,200 outlets across the city with deal-hunters able to enjoy 75 per cent off a wide range of products during the month-long sales. Extended for an additional week to give people even more reasons to shop, win and play, many of the popular events and promotions featured in previous years, such as 12 Hour Sale and Market Outside the Box (MOTB) will be returning even bigger and better, as well as exciting new additions to be revealed, DSF Weekend Surprises and Shop the Night Away. • 12 Hour Sale: DSF will again kick off in style with a mammoth12hour sale, giving customers up to 90 per cent off at Mall of the Emirates, City Centre Mirdif, City Centre Deira, City Centre Me‘aisem, City Centre Barsha and City Centre Al Shindagha. Starting at midday and running right through to midnight, top brands in fashion, beauty, homeware and lifestyle will be on offer throughout the 12 hours. • DSF Weekend Surprises: Starting on 27 December, DSF Weekend Surprises will give bargain-hunters the chance to enjoy incredible offers on an exclusive product range at a specified shopping location each weekend. The sale will start at 10am each Thursday, Friday and Saturday until stocks last so savvy shoppers are urged to hit the malls early to take advantage of super savings and never-seen-before offers across a wide range of items from fashion to beauty. • Shop the Night Away: DFRE will partner with exclusive malls to offer ‘Shop the Night Away’ evenings each week throughout DSF. Starting from 6pm each Wednesday, deal-hunters can enjoy promotion bundles at their favourite shops in the mall, as well promotions on food courts and restaurants. The ‘Shop the Night Away’ experiences will also feature exclusive workshops, styling sessions and VIP gift bags. Starting on 9 January, the first ‘Shop the Night Away’ event will take place at malls around the city, full schedule to be released next week. 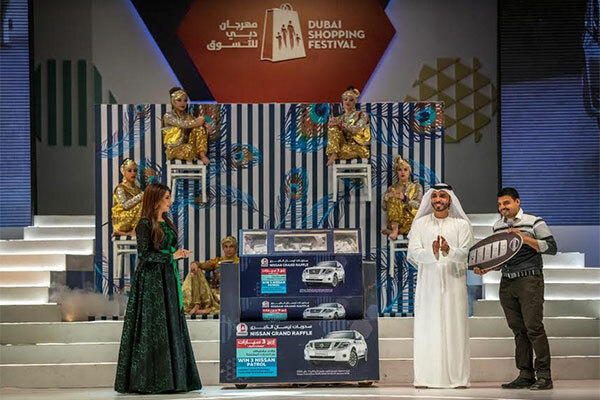 Shoppers have the chance to win an INFINITI QX50 and Dh150,000 ($40,800) daily in mega raffles when the Dubai Shopping Festival (DSF) returns for its 24th edition. A daily Nissan grand raffle will also offer shoppers the chance to win one of seven Nissan models. To enter the INFINITI mega raffle draw, customers need to purchase a raffle ticket for Dh200 starting 15 October. For the Nissan raffle draw, customers need to spend Dh20 on non-fuel purchases at Enoc and Eppco stations and Zoom stores. Additionally, five lucky INFINITI raffle ticket holders will get a weekly chance to win Dh20,000 each over a period of five weeks during the DSF. One raffle ticket holder will also get a chance to win a mega cash prize of Dh500,000 as the DSF concludes. • Fireworks: The city’s night sky will light up with mesmerising firework displays throughout DSF with fireworks taking place each Thursday and Friday at Al Seef, La Mer and The Beach. • Market Outside the Box (MOTB): The popular MOTB pop-up market will return to Burj Park from 24 January to 2 February, offering visitors the chance to shop unique homegrown brands and local designers. Families can enjoy roaming entertainment, kids’ play areas as well a variety of tasty dishes from street-style food vendors. In addition to the series of incredible sales and promotions, DSF will also offer an extensive line-up of exciting events and activities for residents and visitors to choose from including concerts by music icons and free-to-attend family-oriented activities in malls and activations by leading brands.